Today we look at Philadelphia's former Majestic Hotel, once located at Broad Street and Girard Avenue. Broad Street is the original routing of the famed Lincoln Highway. Due to the lack of a date or postmark, the dating on this can only be whittled down to a period between the Lincoln Highway's inception in 1912, and the disuse of the Metropolitan Opera House by the Metropolitan Opera in 1920, and eventual closure as an opera house in 1934. Judging by the look of postcards from the hotel in the 1920s and 1930s, I believe this postcard foldout dates back to between 1912 and 1920. If someone else knows better, please feel free to let me know in the comments. Anything in quotes is text taken right from the postcards. "IN PHILADELPHIA it's The Majestic"
"WHEN next you visit the Quaker City, let the Hotel Majestic be your host. For here the experienced traveler finds comforts and delights to bring him back again and again. The Majestic offers everything you expect of a high class, up-to-now hostelry; adding a comforting, luxurious atmosphere seldom found. There are five hundred rooms with bath, singly and in distinctive suites. - More than outside rooms; no tall buildings nearby to cut off air, light, or view. European plan. The cafe is quite the liveliest place you could wish for, rich in good food and jolly entertainment. Thoughtfully located away from bustle, noise, and smoke-the Majestic is truly convenient to the business district, theaters, shops and railway stations. The Metropolitan Opera House is a block distant. In brief, here is a hotel where you may sleep well, dine well, live well and be served well. The rates are surprisingly moderate in view of the many unduplicated advantages of the Majestic. Coming?" It was only a five cent trolley ride from the hotel to Shibe Park/Connie Mack Stadium, the former home of the American League Athletics, and the National League Phillies. This made it a favorite stop over for out of town teams, similar to that of Pittsburgh's former Schenley Hotel, now the William Pitt Student Union at the University of Pittsburgh. A similar reuse for the Majestic Hotel would have been terrific, given the close proximity to Temple University. "A promise of homelike comfort and true hospitality greets you when first you enter the Majestic." "Possibly half a dozen of the world's great hotels are furnished in as rich, good taste as the Majestic." "Note the bright, cheery appearance of this first floor room. 499 other rooms as considerate of your comfort." "The Majestic is well provided with parlors and quaint nooks for the pleasure of guests. This is the Gold Room." "One of the splendid restaurants at the Majestic. Club breakfasts, platter lunches and special dinners added to an unrivaled a la carte service." This ten story building had 234 feet of frontage on Broad and Watts Streets, and 164 feet on Girard and Stiles. "Right on the Lincoln Highway; the Majestic's unusual facilities for motorists include parking space for hundreds of cars." 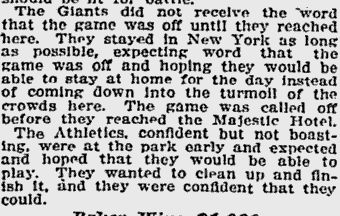 The Connie Mack lead, Philadelphia Athletics, won the series in six games, in Philly at the old Shibe Park, with a 13 to 2 rout of the hated Giants. 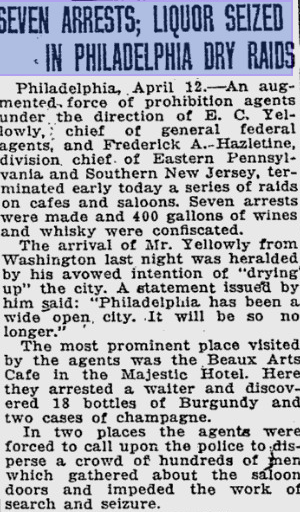 A Prohibition "dry" raid yielded "two cases of champaign, and eighteen bottles of burgundy," according to this 1923 Reading Times article. The 1936 Democratic Convention was held in Philadelphia, which lead to the nomination of FDR for his quest for his second term in office. 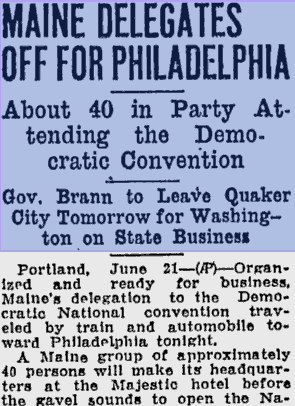 Some of the delegates stayed at the hotel, including those from Maine, as mentioned in the following article from Lewiston, Maine's Daily Sun. The convention was held at the former Convention Center and at Franklin Field, the latter being the NCAA's oldest stadium, utilized by the Penn Quakers since 1895 and home to the prestigious Penn Relays. The Majestic, a truly majestic building, was purchased by the Philadelphia Redevelopment Authority in 1963. The hotel's operations ended upon purchase but the Redevelopment Authority for "bigger and better things." A number of family owned businesses that occupied the streetfront portions of the building were closed as a result of this purchase. The reasoning given by the Redevelopment Authority was for the "Southwest Temple" project, a plan to expand Temple instead of it getting moved to the suburbs. The building was slated for demolition in 1966, but was not actually torn down until 1971. Don't worry though, they had big plans for progress. 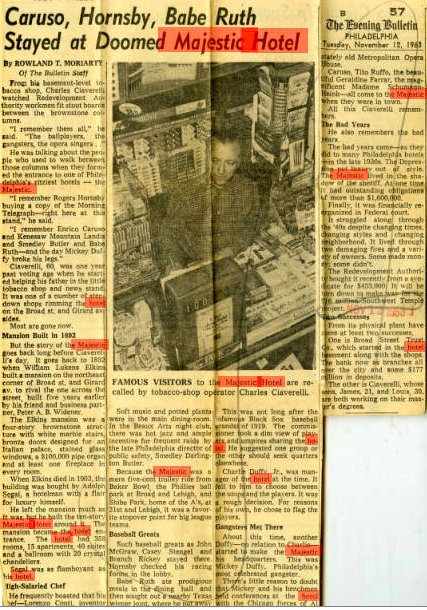 -Philadelphia Evening Bulletin, November 25th, 1965. Say hello to progress! A McDonalds and BP gas station. I don't know who in their right mind could look at a building of that majesty (no pun intended) and tear it down. What is progress? I would love to see the percentage of these "redevelopment" projects turn into anything decent. We lose a piece of our cultural fabric for a fast food joint and gas station? Temple University is not even a mile away from this spot. They couldn't redevelop the building into a dormitory or for some sort of purpose related to Temple? It is such a shame that this building had to go in this manner. Large sections of this area of Philly were bulldozed and the occupants sent packing. Gentrification would start to take over, pushing any remaining residents out of the area. Hopefully when a gem like this is threatened, we take a second look and attempt to configure these community assets into the future of the community. Creative reuse for buildings keeps the communities intact, while also bringing progress to the community. We lost a world-class hotel building to the promise of "residential and office property," but in reality, what came of the removal of this building was a gas station and fast food joint, things you can find in hundreds of thousands of other places around the country.